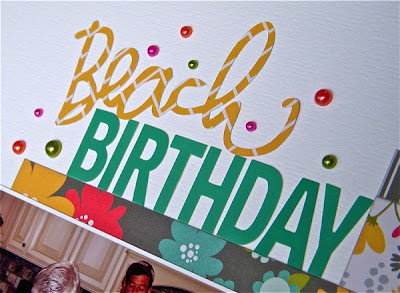 Home decor trends can be a creative source of ideas for scrapbook page design. In 2013, one of the evident trends is punchy flowers with stripes. My Get It Scrapped! assignment was to use this pattern combo on a layout. 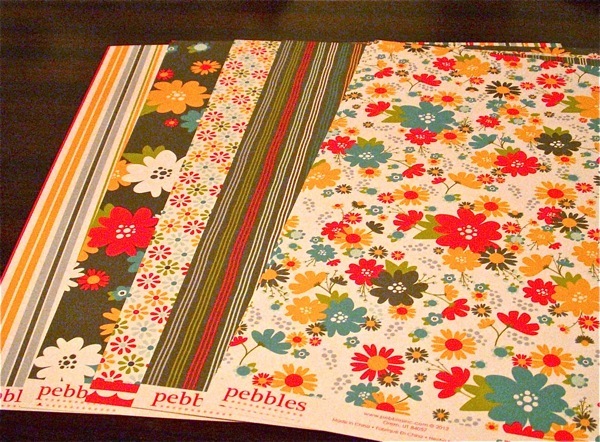 Choosing a coordinated product line takes the guess work out of mixing patterns and colors. This collection from Pebbles contains a pleasing variety of stripes and florals in bright, "punchy" colors. I especially like the contrast of the white and grey backgrounds. To create the title, I cut the script word with my Silhouette, paired it with Pebbles letter stickers and added Doodlebug Mini Pearls. There are more examples from the design team and links to articles with information on mixing patterns right here. What is one of your favorite home decor trends? 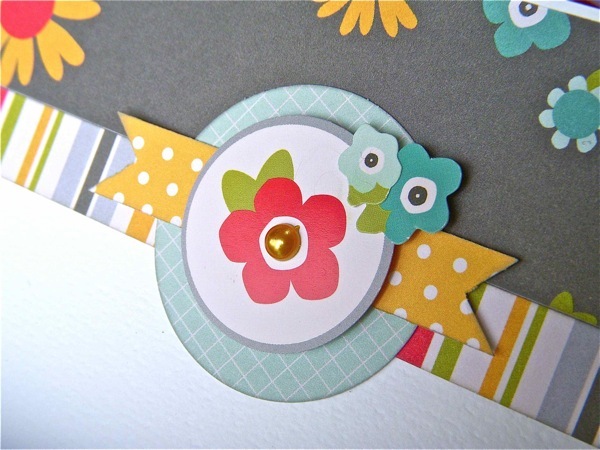 Have you ever tried using it on a scrapbook page? Great page! I love to see stripes and flowers together. I can't think of another home decorating trend I've used, but now I'm thinking about it. super layout- i totally love the added pearls to your title- it really makes it stand out!! Love the design, mix of papers and title work!!! GREAT two-pager!! Love the colors and your crisp design - great job! Love how you used the floral papers. I can never use them because they look so wild but cutting them down mutes them. Lovely, lovely layout Sue! Great design for the 2 pager! Great product choices! Awesome stacked embellishments! And this is a fun collection. I have a couple of them but haven't found the right photos yet. I love to mix florals and stripes -- it's my favorite combo! It always works. Really awesome page Sue!! 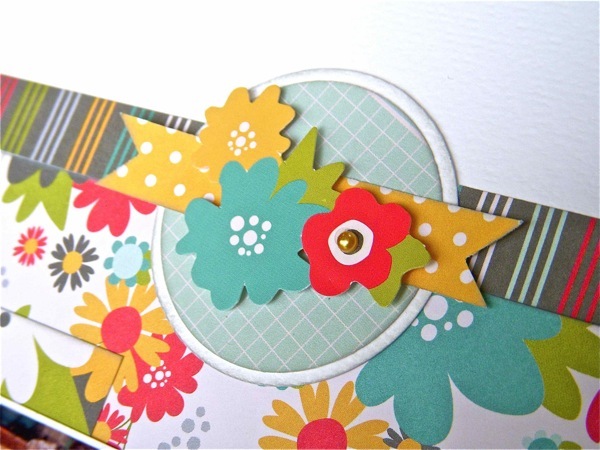 Love how you used the stripes and the florals and I really love the mix of Yellow, Teal, Red, and Brown on your layout! And the enamel dots look so fun scattered around your title! Great layouts. Love the double spread...and OMG, all the colors in the photos are perfect for those papers. I like your title with all those mini colorful pearls around it. Very festive. You did a great job using this floral paper. Chevrons and other geometric patterns are popular in both paper and fabric for the home these days. I like your embellishments. the other advantage is that you only make what you use and don't have odd ones floating around after you've used the rest of thepack! This two pager is gorgeous! Great 2 page layout. I like all the bright colors on the paper and on the page. Love the colours in this collection and I've Pinned the layout as I am having a run of doubles at the moment. Those are definitely "you" colors & I like how you included lots of white space on your colorful layout. Great layout...These colours have some wow factor...love the way you make the embellishments.